The one recommendation of the Bouchard-Taylor commission on reasonable accommodation that was not met with total indifference was the idea that we should revive the use of the term “French-Canadian” to designate the white, catholic descendents of the French settlers that are otherwise designated as “Pur Laine” or “Old Stock” Québécois. The idea was universally ridiculed. Sovereignists objected that they were not Canadians. Federalists took offence that they should wear an hyphenated label in their own country. Third generation French-speaking federalist descendents of Portuguese immigrants wondered if the label applied to them or not. The two wise men did have a point. If Québécois is to designate all the people of Québec, we need some sort of word to designate the white French-speaking majority, if only because without it the Canadian media will have to project all of it’s self-righteous fear of Others on the Americans, and that’s bad for business. But on this Canada Day I want to bring to your attention the fact that there is second very important word missing from both the French and English languages. How do you call English-speaking Canadians? Belgium is the name of the country shared two people, the Dutch-speaking Flemish and the French-speaking Wallons. Britain is the country shared by the English, Welsh and Scots. All these people can call themselves British without fear of losing their own national identity. European is a label increasingly popular with a younger generation that can use it without feeling like they are abandoning their French, Spanish or Greek identity. Canada is the union of the Québécois and the, well, eh… Canadians…. If Canada is to remain united (for many reasons the AGF is not a supporter of a united Canada, but for argument’s sake, let’s suppose he is) it needs an umbrella identity that can be used as a label for all the people living in the federation without implying that their more specific identity is not valid anymore. That label is probably… Canada and Canadian. Canadian was until the 20th century the label used to describe exclusively the French-speaking North Americans. Since the second world war, the label has been embraced by English-speaking Canadians while it was rejected by a growing number of French-speakers. On early maps and journals by the settlers, Canadian was a word used to describe natives. As a label that was once used to describe all three of Canada’s founding peoples, Canadian is the obvious choice for a general name for all inhabitants of the federation the way British is used for the English, Scots and Welsh. So now the problem is: We need a name for those darn English-speakers! Although it is sometimes resented for a variety of reasons, I say we should baptize English-Canada The ROC. I mean officially. Beyond it’s etymological root of Rest Of Canada that some find reductive, ROC is the only name for English-Canada as a whole that has any sort of real use in current language. ROC has some geographical grounding, evoking the Canadian Shield, the Rocky mountains and The Rock, Newfoundland. ROC also evokes English-Canada’s extremely successful music scene and the rugged rock and roll sport of hockey. Not to be underestimated, ROC sounds cool. There are worst things that could happen to English-Canadians than to become known as Rockers! If it was up to me, here’s what I’d give you for your birthday, Canada: I’d get the House of Commons to officially recognize the ROC Nation! Thinking about it, it’s one thing I’ve ever told you. You know, one of the reasons I don’t tell you more often is that I worry that it might actually offend you. You know, who am I to thank you for anything? What makes me think your doing it for me? You know what I mean? Even I spend a lot of time disputing the idea that there is such a thing as You and Me. But we’re family, you know what I’m talking about. I’m the old kind, you’re the other kind or the new kind. Are we one of a kind? Most often we don’t know. But you know and I know that you don’t have to care about French in America but you do. You could live in New Jersey but you live in Laval. There are so many places where everything would be so much easier, where the roads would be better, but you’d just as soon live somewhere where things are stranger and harder. The Quiet Revolution started over forty years ago. Nearly everyone reading this post was born after that. Many of your parents migrant parents weren’t even in Québec when it started, yet they landed in this anachronistic itch in North America’s side and still decided to be part of it. No one here was caught by surprise by the culture and language conflicts of Québec. Yet, we’re still here. We all had a chance to leave and yet we stayed. Or came back. Thank you the bitter refugee, the one who didn’t even want to come to this not-quite-country. This is not the Canada you thought you were coming to. I know why you stayed, though. You saw people living through linguistic chaos, ethnic tension, culture clashes and it reminded you of home in the good days, before those things tore it apart. I know you won’t let your kids live through that. Even you, the most pigheaded unilingual Anglo deep inside Montreal West. You could have been a pigheaded Anglo in Kingston, Ontario, where everybody is a pigheaded Anglo. But you chose to be a pigheaded Anglo in Québec, where that makes you an anarchist, a subversive, a freak. Respect. We don’t agree about many things, but then, what families do? What do we have in common? We don’t buy the lie that there’s anything abnormal about living in a conflicted place. Everybody in Québec today does not agree about what Québec is, but no one has any illusion that it is like anywhere else. Maybe we’re not the same. But we all are what we are because we met in this place that is not like any other. Howard Galganov Has a Legitimate Case. The self-proclaimed language rights activist has embarked on a campaign against the Ontario township of Russell’s bylaw that requires all businesses in the area to have bilingual signs in both French and English. The rule was adopted after a series of incidents where Francophones of the township complained that local businesses, notably the governmentally-operated Beer Store, had english-only signs. Russell township is about equally French and English. Mr. Galganov’s problem with the legislation is that, according to him, it limits his freedom of expression, a freedom protected by the Canadian Charter of Human Rights. Not only does it deny him the right to put up signs in English only, he rightly points out that it denies area francophones the right to put up signs only in French, should they choose to do so. The idea that commercial signs are a form of personal expression and therefore a protected form of speech is controversial, but it has nevertheless been recognized by the Supreme Court of Canada during the various challenges to Québec’s sign law. Howard Galganov has a perfectly legitimate case. It’s not a very strong one, though. The Supreme Court of Canada has said that commercial signs are a protected form of speech, but it also said that they could be regulated. Québec’s amended sign law, for example, which allows English and other languages on signs as long as French is predominant, is perfectly constitutional. We will all find out when he pleads his case in the courts. Mr. Galganov and his supporters will present their arguments and explain in what way their rights are being violated. The defenders of the bylaw, starting with township mayor Ken Hill, will explain why the law does not unfairly limit anybody’s rights. An impartial judge will decide. Democracy. Rule of law. Justice. The system at it’s best. Howard Galganov has a legitimate case. Unfortunately, that is not the case he is fighting. Using the Russel township bylaw as a pretext, Howard Galganov is waging war against democracy and a group of individuals singled out because of their language: francophones. 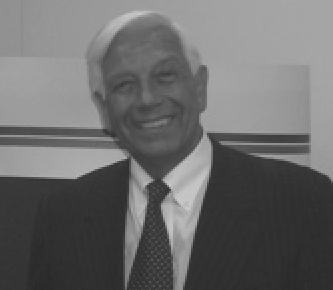 Howard Galganov is not a resident of Russel township. He only rented a storefront there and became a member of the chamber of commerce on June 18th, several days after announcing he would challenge the bylaw in court and months after he started his campaign against it. Howard Galganov does not believe the people of the township have the right to decide for themselves what laws meet their own community standards. Nor is he merely supporting local opponents of the law. He is forcing himself and his ideas into someone else’s family affair. That, however, is a minor detail compared to the much darker side of his crusade. Apart from the legal challenge to the bylaw, Howard Galganov is financing a vast public opinion campaign, which is is a perfectly legitimate thing to do. As part of this campaign, Mr. Galganov is calling for a boycott of all French-owned businesses in the area. Now, by all accounts, the bylaw is controversial in all parts of the township, including within the French-speaking community. The bylaw’s champion is mayor Ken Hill, an anglophone. The law was voted by the democratically elected representatives of the township, both French and English. Yet, Howard Galganov asks his supporters to punish only the French-speaking business owners. Only those who speak French, regardless of the fact that they could individually be supporters or opponents of the bylaw. Regardless of the fact that they could be members of the chamber of commerce that opposes the bylaw. Howard Galganov asks his supporters to ignore the actual language of the signs, to look only at the surname on it. According to him Raynald Godin of Godin’s Hardware should be punished for being a Godin, even is his sign is in English, French, Tagalog or any combination thereof. A boycott of Russell township francophones in protest of a municipal bylaw is the same thing as boycotting Anglo-owned businesses in Montreal to protest the decline of French in Montreal regardless of how these individual businesses treat their francophone patrons. It is the same thing as boycotting all Jewish-owned businesses to protest Israël’s occupation of the west bank, regardless of these individual business-owners’ opinion, if any, on Middle-Eastern geopolitics. something very sinister that has a variety of names. Names Mr.
victim of such logic and activity. Since I did offer him an opportunity do defend his position, he can’t call me unfair or dishonest anymore. As for insulting, he’ll have to get used to that. Last March a Polk County judge in Iowa ruled that the State government was violating it’s own laws by providing websites and voter registration forms in a variety of languages, including Spanish and Vietnamese. Iowa, you see, made English it’s sole official language in 2002. It is one of 30 states that have enacted some form of legislation making English their official language. At the federal level the United States do not have an official language. English is de facto the language of administration, but there is no official language act that says has to be that way. Legislation to that effect has been introduced many times in the Congress, as recently as 2006, but as of yet none has successfully survived the Washington legislative process. A the frontline of the Official English movement is the US English organization founded in 1983. The current president of US English is Mauro E. Mujica, a naturalized US citizen born in Chile who speaks fluent English, Spanish and French. 1.Can you tell me how someone with your background, Spanish-speaking, born outside the United States, came to the conclusion that the US needed to make the English language official? When I came as an immigrant to an English speaking country, I knew that I had to learn the language of the country I was going to in order to be successful. In fact, when I first came here, I assumed that English was already the official language of the United States. In addition to my experience as an immigrant, I also discovered the importance of a common language during my career as an architect. Many of the projects I worked on involved projects overseas – projects I would be unable to get if I didn’t speak the language of that country, or if we did not have a common language through which to conduct business. To build a nation, all you need are people. But to build a civically united society, you need the common bond of language. 2.Considering that English is the uncontested global language and that 95% of the children of immigrants to the US are considered fluent, isn’t pro-English legislation just overkill? The societal expectation is that immigrants to the United States will learn English and become Americans. The discussion of the second generation ignores the fact that a growing number of immigrants are unable to speak English themselves, and that a rather significant gap exists between societal expectation and reality. Census data reveals that for some immigrant groups, less than half of the immigrants living in the United States are considered proficient in the language that will enable them to get better jobs, earn higher incomes and help their children advance to higher education. The intended audience of promoting English acquisition is the immigrant his/herself, much like the intended audience for message promoting smoking cessation is the smoker him/herself. Furthermore, when we are talking about fluency in English, a characteristic that the Urban Institute called “the most effective anti-poverty tool for working families” in the United States, 95 percent English acquisition is not an acceptable figure among the second generation. There are some startling facts about English fluency that run counter to the notion of English acquisition. According to the U.S. Census, there were more than two million native born Americans, age five and older, who spoke little or no English. That’s two million people born in this country, presumably raised and educated in this country, who speak English at the lowest levels of proficiency. Finally, 95 percent is simply not a good enough figure to sit back and rest. We should be no more proud of a 95 percent English acquisition rate for the children of immigrants, than we would be about a 95 percent graduation rate or a statistic showing that 95 percent of the children of drug abusers don’t abuse drugs. In any of those cases, there is still a significant portion of the population that will be unable to reach its highest potential, and will be more likely to require government services. 3.I’m sure you have studied official language models worldwide. What countries, according to you, have the best approaches? I have long been impressed by the Israeli adoption of Hebrew as the official language of the country, and the steps the nation takes to ensure that new residents are able to read, write and converse in this language. 4.How do you feel about Québec’s language legislation? How about the Canadian government’s bilingual approach? As a citizen of the United States, I don’t have an opinion on the Canadian government language policy as it pertains to Canada. The linguistic and ethnic composition of Canada is unique and quite different from that of the United States. On an academic level, however, I feel that understanding language policy in Canada offers lessons in how and how not to formulate a language policy here in the U.S. The experience in Canada offers examples of how language differences can result in social discord, increased expenditures, and pit one side against the other in an us vs. them mentality. I believe the Canadian policy shows several potential pitfalls the United States may endure should it opt to go officially or quasi-officially multilingual. 5.Québec’s language legislation went beyond the government and imposed some obligations to private businesses such as the language of commercial signs, the right to work in French and the right to be served in French. Would such measures be necessary in the US? Would they be possible? The official English legislation proposed in U.S. Congress would not affect the rights of private businesses or business owners. Our legislation is exclusively focused on the language of government and government documents. Official English legislation has never been about preserving the language or the proper use of the language. Instead it is rooted upon the belief that English, however accented or pronounced, is the unifying factor in this diverse nation. 6. US English has been accused to be a polite and clean facade for anti-Mexican and anti-immigration sentiment. How do you feel about those accusations? It is unfortunate that some individuals choose to stymie debate on the official language issue by mischaracterizing its supporters. In reality, many supporters of official English are immigrants or children of immigrants. In polls, first- and second-generation Americans demonstrate the same level of support for official English as do Americans of the third-generation and beyond. Furthermore, labeling the more than 80 percent of the nation that supports English as “xenophobic” is an extremely pessimistic view of the United States population. Beautiful interview with Leonard Cohen (google translation)in La Presse this morning. It is so refreshing to hear a Montrealer who understands and accepts with such lucidity the reasons of the estrangement he feels in his own city, without feeling he needs to condone or condemn. It is also rare to see a Anglo-Canadian artist, let alone one who is an international legend, treat the francophone public with such affection and respect. Not many international superstars play the Cégep de Chicoutimi and I’m pretty sure none ever addressed the Moncton public mostly in French. Last Wednesday underground deities and most brilliant musical group since Harmonium to come out of Montreal, A Silver Mt.Zion and Tra-la-la Band (formerly Godspeed You! Black Emperor) played Sala Rossa on the Main. We got one “Merci” and one “Merci d’être venu ce soir”. You’d think they had it all: beaches, calypso and English. Trinidad and Tobago wants the entire country to learn Spanish by 2020. “If the government did not take this step, to ensure our nationals are not left behind this global trend of bi-lingualism, our nationals would not be competitive in the global marketplaces of tomorrow“, reads the website of the The Secretariat for The Implementation of Spanish. Latin America is expected to be one of the booming economies of the next century. Demographically Spanish is on the rise all over the continent(s), including in the United States where Hispanics are now the most important minority. Brazil requires all schools to offer Spanish classes and encourages students to pick it as a second language instead of English. The capital of Trinidad and Tobago, Port of Spain, is actively campaigning to be the seat of the Free Trade Area of the Americas. The challenger is Miami, the unofficial capital of the Hispanic USA. Should French and English-Canadians still spend all their resources on learning each others languages or is not time for us to learn our own continent’s common language? Knowledge is Power. English is Not. In English-speaking societies the polite, or the correct, thing to say is that learning more than one language is a good thing. Learning languages is an enriching experience, it opens cultural horizons, facilitates travel and generally separates the good Anglos from the stereotypical Ugly Americans. Multilingual Anglophones realize the personal benefits of languages such as career opportunities and the satisfaction of traveling without the constant impression that someone is talking behind your back, but the conventional wisdom in the English-speaking world is still very much that even though speaking many languages is nice, the only language you actually need, pretty much any where in the world, is English. Learning foreign languages is perceived as a good thing in Anglodia in the same way charity, peacekeeping and volunteering are considered good things. A graceful gesture towards the less fortunate. A reasonable accommodation. In an English-speaking world, uniligual English-speakers are fucked. Today, the world speaks English. That is a fact. But the world hasn’t stopped speaking other languages. That is also a fact. You see, English as an international language is like a two way mirror. The whole world can see/read/understand English, but unilingual Anglos are stuck on the other side, unable to look out. They understand what we chose to say in English, but as soon as we switch to our other languages, they are locked out. This is a serious disadvantage. Take the example of radical Islam. Radical clerics have made some very real inroads in the West, notably in poor urban areas and American jails because they can proselytize in English. On the other hand the CIA, Scotland Yard and the other Western agencies fighting terrorism candidly admit they don’t have enough translators to go through the Internet discussion groups where terrorists plan their attacks, in Arabic, Farsi, or other languages. Or take scholarship. All the research and science coming out of the world’s universities and corporations is published in English. That means that nearly all the scientists and administrators in the world can access, understand and use that information directly, without any help from anyone. On the other hand if an Indian scientist makes an important discovery – say, the nuclear energy field – that could be strategically important for India, it is much easier for him to control the circulation of that information by discussing it with his colleagues only in Hindi, or if his findings are really hot, he can write all his papers in the regional dialect of his youth in Arunachal Pradesh. Sure, translation is possible. It is also costly, time-consuming and totally dependent on other people. And you also have too know there is information you are looking for in the first place. The near universality of English in universities and science has often been accused of being a vicious circle that unfairly advantages native English-speakers, but the the exact opposite is probably closer to the truth. In his book English as a Global Language, linguist David Crystal points out that the British are by far the least competent in languages of all Europeans with only 29% of executives able to conduct negotiations in a language other than English. He cites studies that show that one in three British company has reported losing business because of poor language skills. Business executives in France and Germany have also read those studies and you can bet they have taken note of this advantage they have over the British. Anglo culture -American, British and the rest- was enriched beyond reason by letting so many cultural influences into it’s own world, usually through the English language. This great advantage, however, is slowly turning into a disadvantage as we, the entire planet, can now access the whole of English Language culture, from Seinfeld to Radiohead to lectures by Noam Chomsky to Alan Greenspan’s autobiography as if it were our own, while monoglot English-speakers can only access what we decide to share with them. Knowledge is power. Who’s got the power now? And if you are still not convinced that speaking only English will make you the laughing-stock of the globalized world, just click HERE. 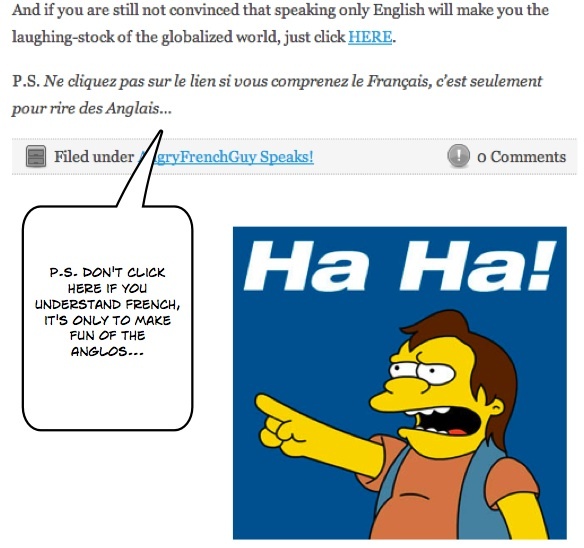 Ne cliquez pas sur le lien si vous parlez français, c’est seulement pour rire des Anglais.